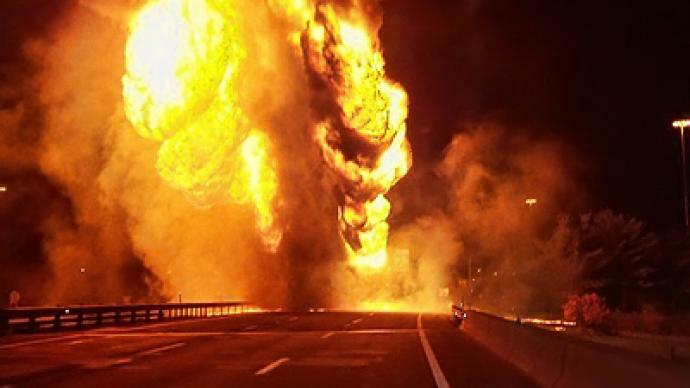 An incident with a tanker in Russian city of Saratov resulted in 40 burned cars and three persons with burn injuries. ­The driver of a gas-tank truck with 20 tons of petrol crashed into a lamp post due to bad driving, after which the truck flipped over, spilling gasoline into a nearby parking lot. The gas then caught fire, immersing the area in flame. Up to 40 cars met their fate in the manmade lake of fire 300 sq. meters in area. Two employees from a tire fitting shop were stranded at work, and were unable to escape until being rescued by firefighters who had to tear the bars off the windows at their shop. The men suffered major burns and were hospitalized in critical condition together with the truck driver who also suffered burns. The video footage was made by Youtube user MikeSar555.